Deep bass gets things going, powering dance beats, defining rock basslines and adding tone to vocals. 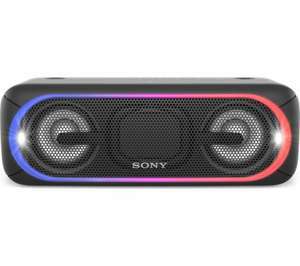 Press the EXTRA BASS button on your Sony SRS-XB40 Portable Bluetooth Wireless Speaker to give your music a boost. Its full-range speakers and passive bass radiators make your favourite songs sound as good as they should. A portable speaker should let you listen for longer. The SRS XB40 does – with up to 24 hours of battery life you can literally enjoy music day and night. You'll know when to recharge with a handy voice feedback feature. Set the tone with adjustable, multi-coloured lighting. Relax with your favourite sounds indoors, or take them poolside or on a picnic to liven up outdoor gatherings. The SRSXB40 Bluetooth Speaker is water-resistant (IPX5 rated), so it'll withstand accidental splashes. Pick it up and take it wherever you go. Stream music from your smartphone, tablet, MP3 player or compatible device to the XB40 using Bluetooth. NFC enables one-touch paring, so making a connection with your device is seamless. Enjoy smoother, clearer listening as LDAC5 technology transmits three times the data of standard Bluetooth. 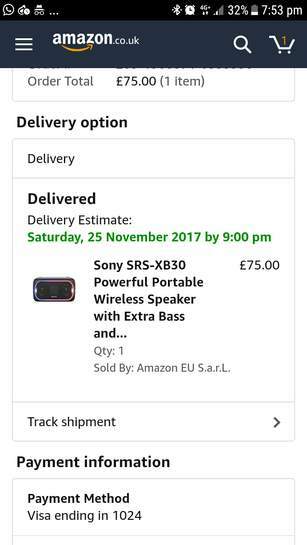 Enjoy enhanced sound by wirelessly syncing several compatible Sony speakers (each sold separately) with Party Chain. Hear the same song, bigger and better, with two or three speakers to widen the stereo image and create room-filling sound. It's enough to get any party going. The SongPal app lets you control your connected devices and manage your music. Use the Fiestable app for playback control, adjusting the speaker lights and even applying DJ sound effects - straight from your smartphone. All that info and I still can't find how many watts?! They trying to hide it or am I just blind? 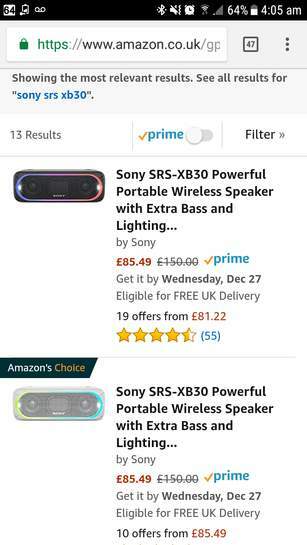 seems the blue and red are same price on amazon. All that info and I still can't find how many watts?! They trying to hide …All that info and I still can't find how many watts?! They trying to hide it or am I just blind? @hkayani Hi, could you please turn on private messages? I need some help with XB40. Unfortunately I'm still not able to PM you. I got your message but I'm not able to reply.